Election 2018: Yes on Proposition 10! Real Rent Control Now: Repeal Costa-Hawkins in 2018! ​​We need your help to win in November. Join the campaign here! Have you ever wondered why some Oakland renters are protected by rent control while others are left to the whims of their landlord? Or why your friends and family around the Bay Area and California may have no protection from impossible rent increases at all? The answer: Costa-Hawkins. The Costa-Hawkins Rental Housing Act (CA Civil Code Section 1954.50) was passed in the state legislature in 1996 by the real estate lobby to prevent California cities from protecting their tenants against unlimited rent increases. Cities like Oakland, Berkeley, and San Francisco cannot expand rent control protections to units built after their original rent control ordinance was established (so, in Oakland only buildings built before 1983 can be protected). Even if a city establishes a new rent control ordinance (like Richmond did in 2016), the city cannot apply rent control to any building built after 1995. No city can apply rent control to rented single-family houses, or condominium units, a huge loophole. Rent-controlled units are subject to "vacancy de-control", meaning that every time a protected unit becomes vacant (including through eviction) the landlord can raise the rent for the next tenant as high as the market will allow. Join a statewide coalition of housing rights advocates including OTU to repeal Costa-Hawkins and give cities the right to protect tenants from the whims of the real estate market. Following the failure of a repeal bill in Sacramento, the only way to achieve real rent control in California will be Proposition 10 on the November 6, 2018 statewide ballot to repeal Costa-Hawkins and leave it to cities to decide whether, and how, to protect their residents from sky-rocketing rents. Give cities the right to establish or expand local rent control programs, the way local governments and voters see fit. Pave the way for universal tenant protections by ending loophole exemptions for single-family and condominium units, and units in newer buildings. Increase the supply of affordable rentals by allowing cities to cap rent increases for all rental units, even between move-ins. To find out how you can help repeal Costa-Hawkins in 2018, see more about the Bay Area campaign here. You can stay plugged in with Oakland Tenants Union's repeal efforts on our OTU facebook page too. For more information about Costa-Hawkins and why it's so important to renters, learn more here. Read the full content of the proposed ballot measure here. Election 2018: Yes on Measure Y! Close the Loophole: Protect Oakland Renters from Eviction! Measure Y is a fair and reasonable approach to Oakland’s housing crisis that will extend Just Cause eviction protections to thousands of renters who currently face displacement for no reason. Oakland's Just Cause eviction law has been in place since 2003 and requires landlords to provide one of 11 specific "just cause" reasons for an eviction (like failure to pay rent, or major damage to the property), meaning a tenant cannot simply be evicted at the whim of their landlord. However, there is a serious loophole in the Just Cause law -- in duplex and triplex rental buildings an owner can exempt the property from Just Cause protections by claiming to live in one of the units. This loophole has been widely abused by landlords seeking to evict tenants who have done nothing wrong, and there are about 8,000 Oakland tenants living in duplex and triplex units who are vulnerable to displacement as a result. Just Cause protections do not prevent landlords from evicting for themselves or a relative to reside in their property, or choosing who they rent to, or evicting for “good cause." Landlords who live in the same house or unit as their tenants will continue to remain exempt under Measure Y, but the other tenants in the building would be protected. Measure Y simply expands laws that have protected renters for years, and eliminates a major loophole in eviction protections. 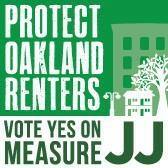 Follow the Protect Oakland Renters campaign here. Read the full text of Measure Y here. Election 2018: Yes on Measure W! Over the last decade, Oakland has been suffering under skyrocketing rates of homelessness -- a staggering 25% increase in just the two years before the last count of December 2015. Growing homelessness is causing widespread pain and despair as people -- including increased numbers of elderly, women, and school-age children, often without bathrooms, water, sanitation, and essentials of living with dignity. At the same time, the City estimates that at least 5,000 buildings and properties in the City of Oakland lie vacant or unused. These vacant properties negatively impact our community, attracting crime, blight and illegal dumping. In addition, vacant properties ineffectively take up space that can be better used for housing and other purposes, thereby reducing potential jobs and tax revenue for our community. Measure W would place an annual tax of up to $6,000 on vacant parcels, buildings, and real property within the City of Oakland, with exemptions for property owners who are low-income, senior citizens, non-profits, or demonstrate other forms of hardship or can demonstrate they are in the process of improving the property. These tax funds would be used to provide services and programs to homeless people, reduce homelessness, and support the protection of existing housing and production of housing affordable to lower income households. In addition, no less than 25% of the tax funds must go towards remediating blight and illegal dumping. The Measure establishes a Commission on Homelessness, composed of City residents, which may make recommendations on how to allocate the tax funds, and shall publish an annual report regarding how this tax has been implemented. Vote YES on Measure W to fund solutions to homelessness, displacement, and illegal dumping, and to encourage productive uses of properties in the City Of Oakland that put people first! Read the full text of Measure W here. Oakland has a condominium conversion ordinance that controls how property owners can legally convert rental apartment units into for-sale condominium homes in Oakland. The current ordinance was adopted in 1981 and is woefully out of date, overly complicated, easily abused, and leaves thousands of rental units at risk of conversion into condominiums. Oakland Tenants Union advocates for major revisions to the ordinance in order to protect as many rental units as possible from being converted. The Oakland City Council is considering new legislation that would require seismic safety retrofits in thousands of "soft story" apartment buildings across the City. ​Who will pay for these costs? Currently, the City is considering allowing landlords to pass along 70% of these costs to tenants. Oakland Tenants Union advocates that seismic retrofit costs should not be charged to tenants. Why? Landlords have a legal (and ethical) responsibility to deliver safe and habitable housing. ​On February 5, 2018 the Oakland City Council expanded requirements for relocation payments to tenants who are subject to a "no fault" eviction from their rental unit, following sustained advocacy by OTU and housing rights allies. Under the new law, any tenant protected under the Just Cause for Eviction law must be compensated by the landlord in cases of "no fault" eviction including for "owner move-in" evictions. More here. ​We passed Measure JJ with 75 percent of the vote on November 8, 2016. THANK YOU to everyone who pitched in to strengthen our renter protections, but our work is far from over! Summary of Measure JJ key provisions and campaign information here.